Instead of merging the disparate worlds of electronic ambience, non-linear improv, experimental rock and droning noise, we've asked ten frequent contributors to write about one release that excited them most this year. "Was the constitution written in invisible ink? Has everyone here forgotten how to think? Is this great big boat starting to sink?" Fair questions. 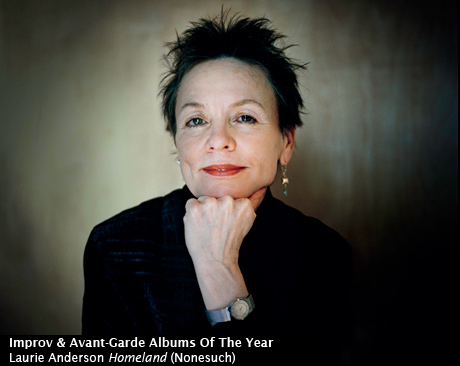 And few are better positioned to play the role of inquisitor than Laurie Anderson, whose wit, perception and poetry have never sounded so engaged with her selected topic ― in this case, the end of an empire ― than they do here. Musically, she combines the best of her sci-fi sounds of the '80s with earthier and exotic instrumentation and manages to make it all breathe beautifully, even the peculiar electronic funk of "Only an Expert," featuring FourTet on keyboards and husband/producer Lou Reed on guitar skronk.